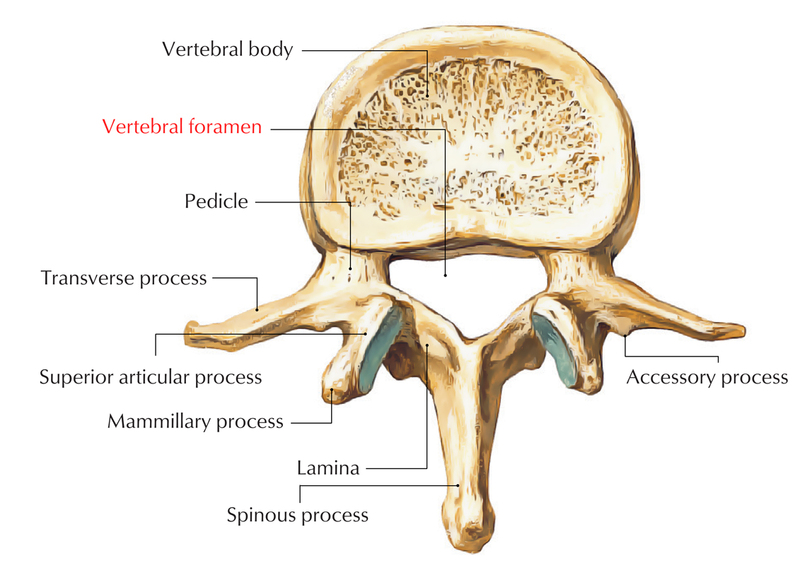 The anterior section known as the body and the posterior section known as the vertebral arch create an opening or foramen known as vertebral foramen which is found within a normal vertebra. The spinal cord and its meninges are contained within the vertebral foramen. Together, the vertebral canal is created by the vertebral foramina of all the vertebrae, which covers and protects the spinal cord. The vertebral canal is constant superiorly from the foramen magnum of the skull with the cranial cavity of the head. The vertebral foramen starts at C1 or atlas and it is constant till inferior to L5. 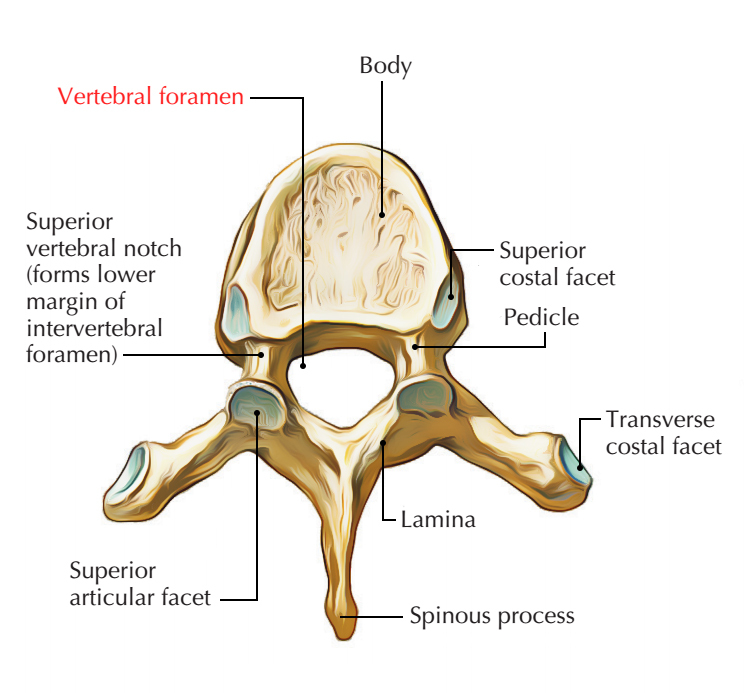 The vertebral arch and the body create a very vital opening known as the vertebral foramen. The vertebral canal is created via the foramina of aligned adjacent vertebrae. Vertebral canal contains the spinal cord. Connective tissues and blood vessels also travel via the vertebral foramen. Have a concave superior surface along with a convex inferior surface. The cervical vertebrae have a triangle shaped vertebral foramen. The vertebral body of the vertebra is heart shaped to a certain degree and the vertebral foramen is round. 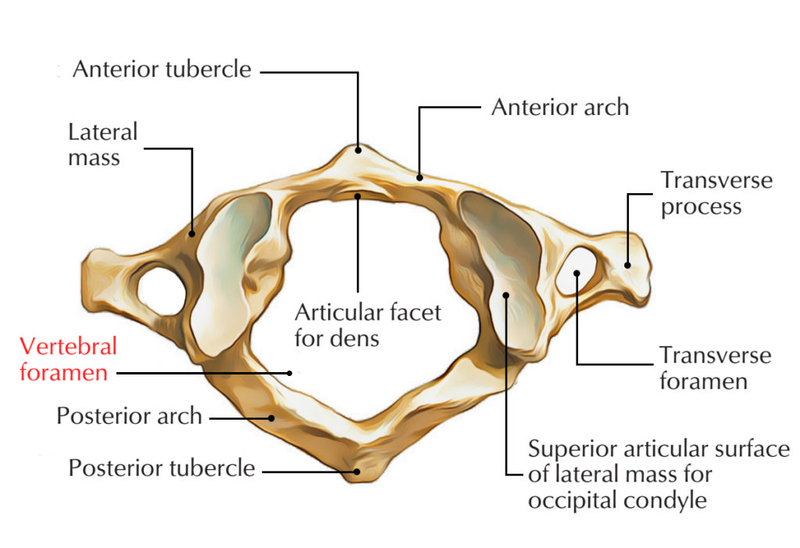 A typical lumbar vertebra has a cylindrical vertebral body and the vertebral foramen is triangle-shaped as well as larger compared to the thoracic vertebrae.